Hello! 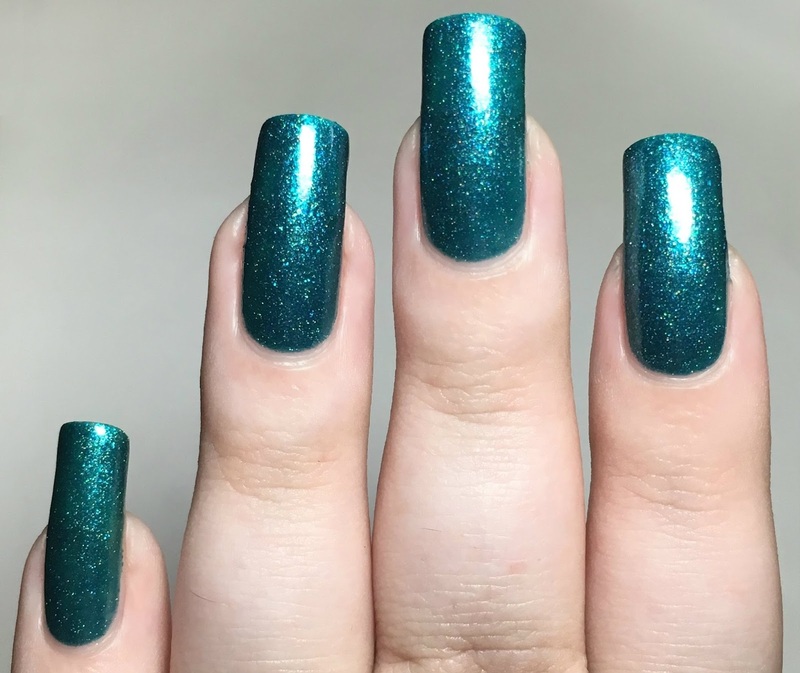 Today I have another one of my Polish Con Chicago polishes to share, this time from Leesha's Lacquer. I was lucky enough to not only have a polish from Leesha in my VIP bag (which I will be swatching soon), but also to win another one of my choosing! 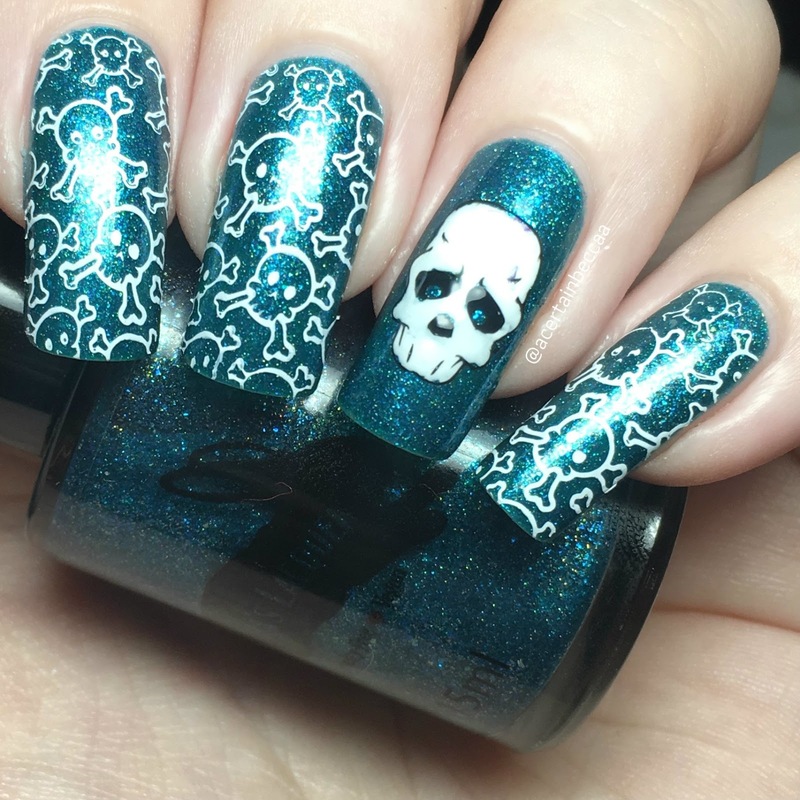 I decided on 'Ow, Oof, My Bones' from the Let's Get Spoopy collection for Halloween. Read on for my swatch and also some Halloween nail art! 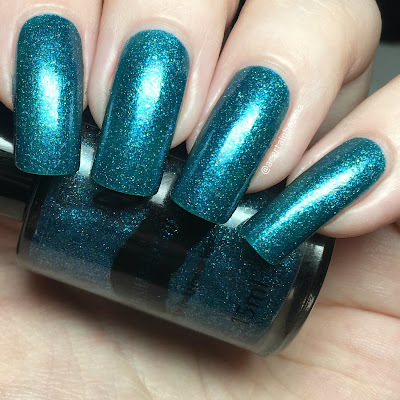 'Ow, Oof, My Bones' is a teal base with both blue and gold glitters. The formula is very smooth and easy to apply. The base was slightly sheer on the first coat but built up nicely in two. I was tempted to add a third coat to give the glitters more depth, but decided against it. Below is two coats with topcoat. For my stamping, I used UberChic Beauty plate Halloween 01, purchased from Rainbow Connection. I couldn't resist sticking to the bone theme to match the name. I reverse stamped the large sad-looking skull on my ring finger using Hit The Bottle 'As Black As Night' and Pretty Serious 'Presence'. 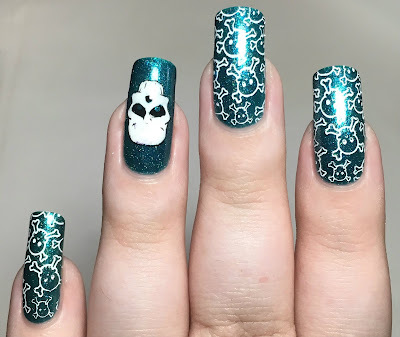 I stamped the smaller repeated skulls on my other nails using Hit The Bottle 'Snowed In'. What do you think? I'm happy to finally be doing Halloween nails, and there was no better day to start than Friday 13th! Thank you again to Leesha for my freebie polish. I couldn't resist a name as amusing as 'Ow, Oof, My Bones' - although it does help that it's gorgeous too! 'Ow, Oof, My Bones', along with the rest of the Let's Get Spoopy Collection will be available on the Leesha's Lacquer website here from 6pm CST today (which I believe is midnight UK time). 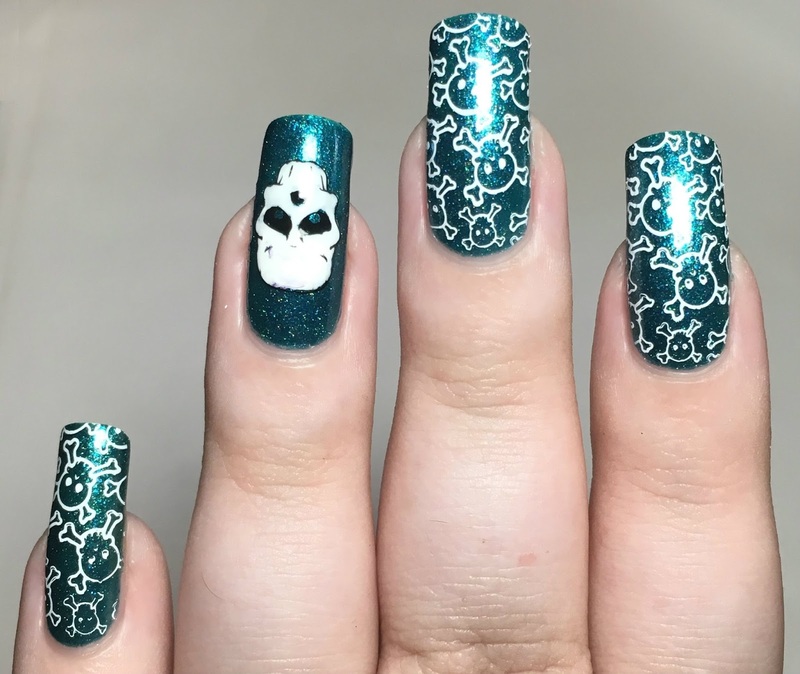 Gorgeous mani and I love the skulls! !